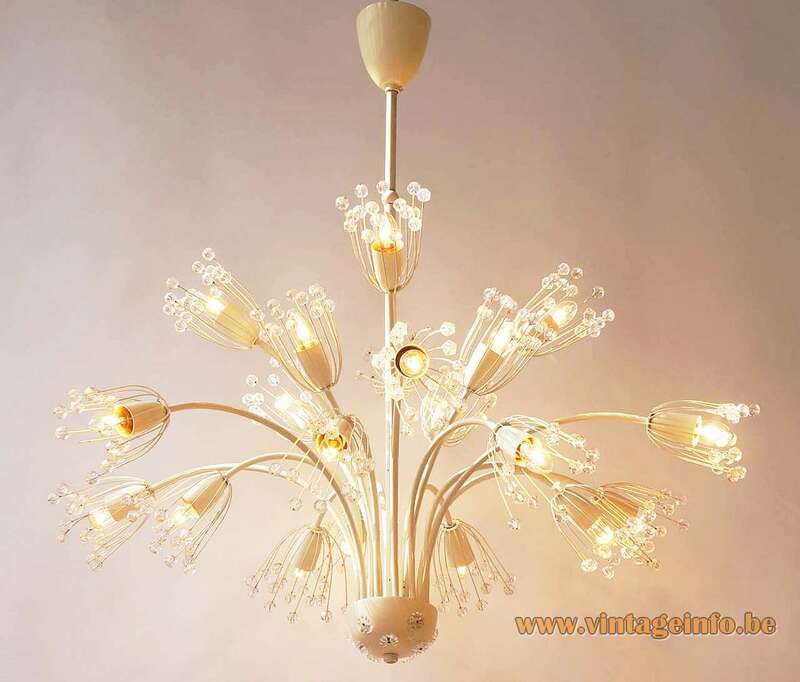 Materials: White painted brass, clear crystal glass beads. 19 Bakelite sockets. 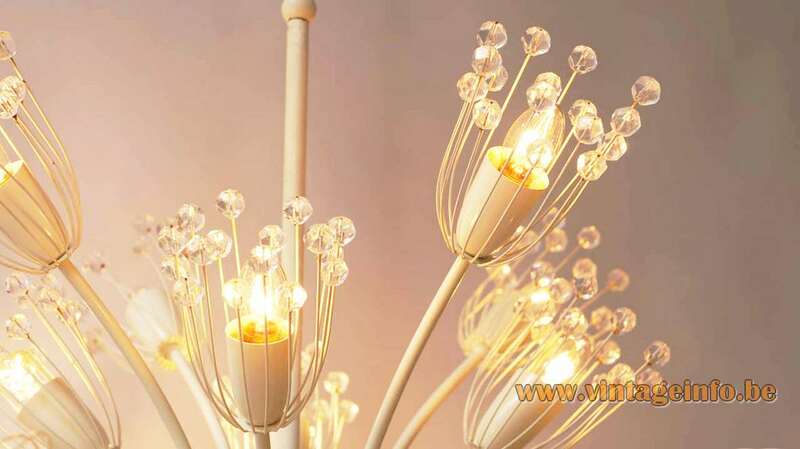 Electricity: 19 bulbs E14, 19 x 40 watt maximum, 110/220 volt. Period: 1950s, 1960s, 1970s – Mid-Century Modern. Designer: Emil Stejnar in the 1950s. Manufacturer: Beleuchtungskörperfabrik und Beleuchtungsglashütten (lighting equipment factory and lighting glassworks) Rupert Nikoll, Vienna, Austria. Other versions: Made in several variations and sizes. Also made in chromed metal and polished brass. 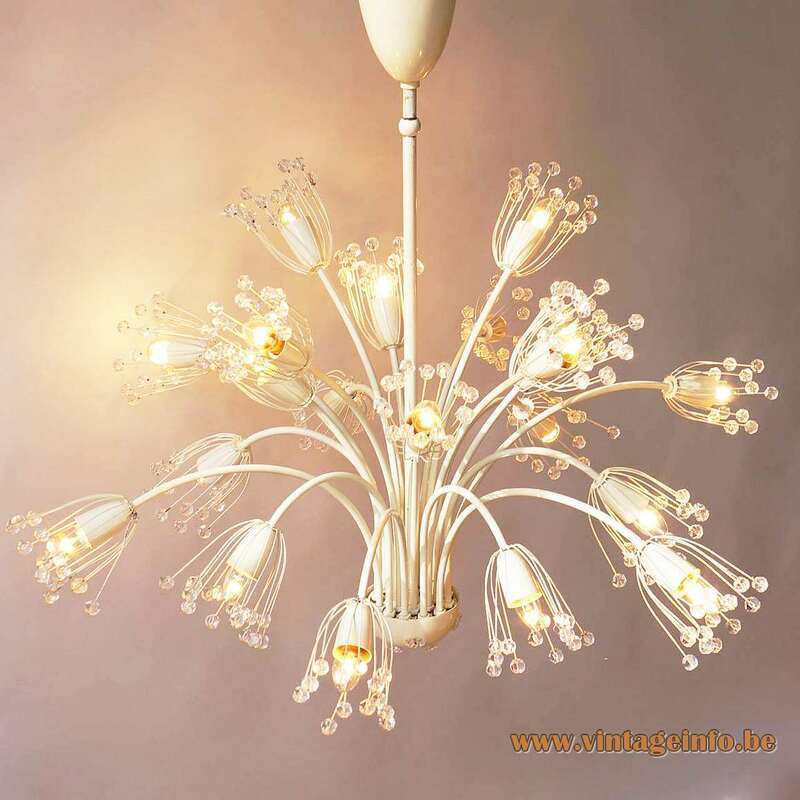 This lamp is often named: Pusteblume or Dandelion (dandelion – taraxacum officinale). Others say Snowball chandelier. Little is known about the Rupert Nikoll factory. The company was founded in 1908 and ended business in 1986. In 1966 the company moved to Ober-Grafendorf some 70 km / 43.5 miles from Vienna. Rupert Nikoll also had a branch in Munich, Germany since 1958. Emil Stenjar (born 1931) is the most famous designer that worked for the company. He is also from Austria. 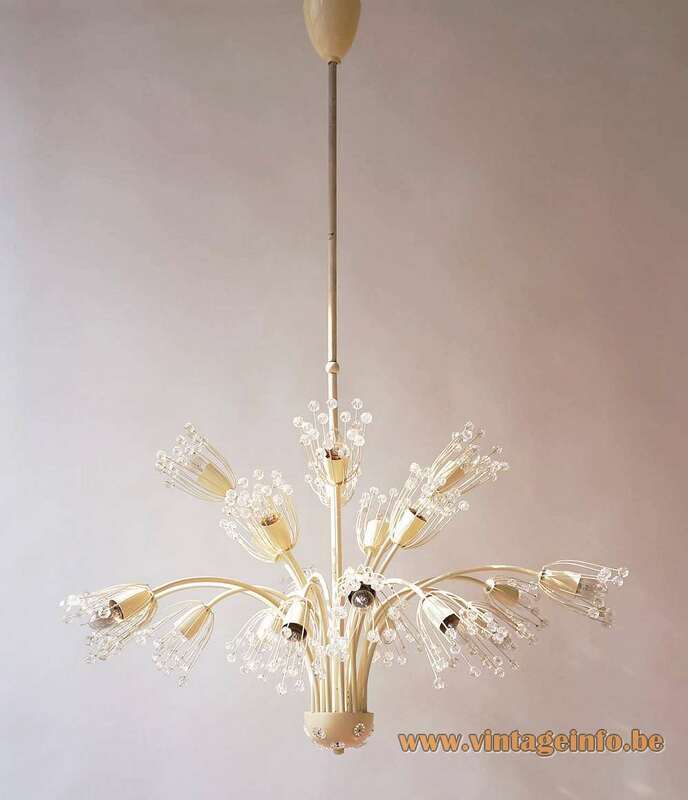 He designed numerous chandeliers, wall lamps, flush mounts and mirrors decorated with crystal glass flowers in the beginning of the 1950s. In 1957, goldsmith and silversmith Stenjar moved to Sweden. He married and returned to Austria in 1968. His designs were produced for decades. Rupert Nikoll is also known for the “Sumatra” floor lamp. Made in brass with an organic lampshade. 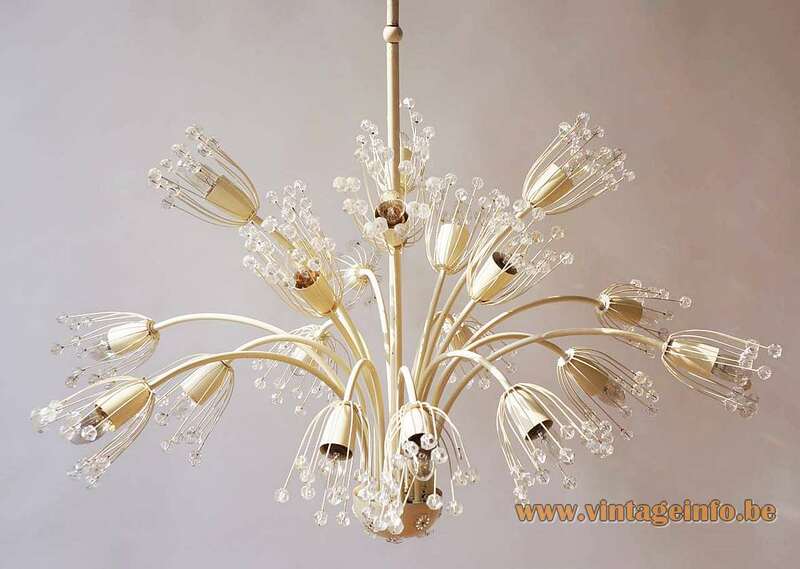 Several lamps were produced with lampshades in this form together with organic materials such as flowers, grasses and cane. Few are left and many have disappeared due to the fragility of the lampshade. 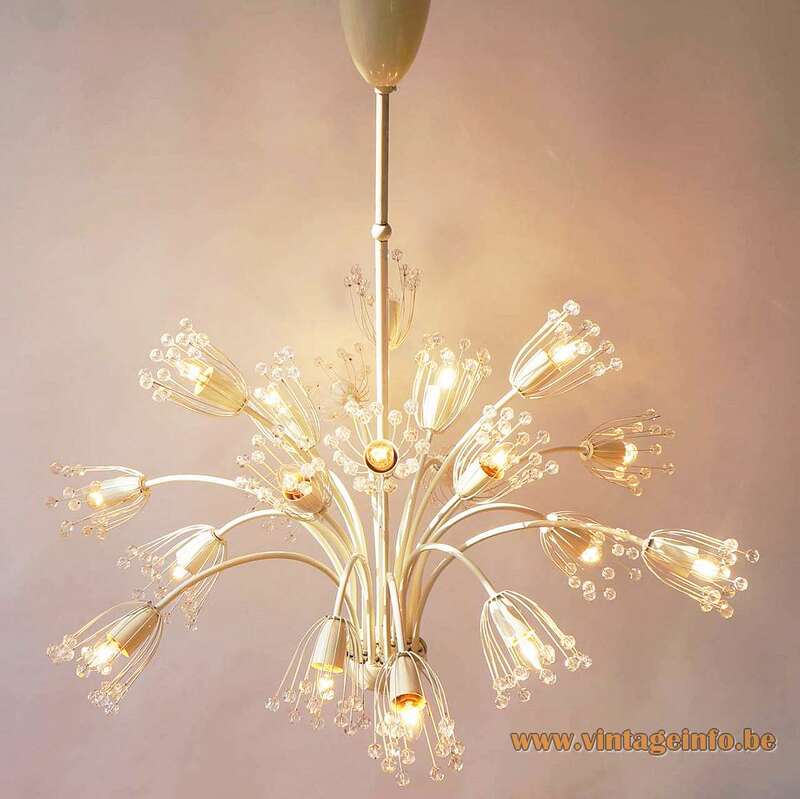 You can find a beautiful example here on Vintageinfo. Many thanks to Frank from Flowermountain.be for the pictures and the enthusiasm.